Village of Hempstead Mayor Wayne J. Hall Sr. today announced the success of his signature initiative to facilitate the empowerment of Hempstead residents. Photo by: Village of Hempstead. Hempstead, NY - February 7, 2017 - Village of Hempstead Mayor Wayne J. Hall Sr. today announced the success of his signature initiative to facilitate the empowerment of Hempstead residents. Dozens of members of the community and Mayor Hall came together at 50 Clinton Street, the site of a new Rivoli development emblematic of the Mayor’s vision for Hempstead, to celebrate the creation of jobs and opportunity in the Village. In partnership with the ABBA Leadership Center, which provides Occupational Safety and Health Administration (OSHA) training for Village residents, the developer employed more than 20 of its construction workers from the Village and prioritized awarding contracts to local businesses. In addition, Rivoli renovated and improved an existing building in the Village, acting on Mayor Hall’s commitment to preserving the historical character and charm of the Village. 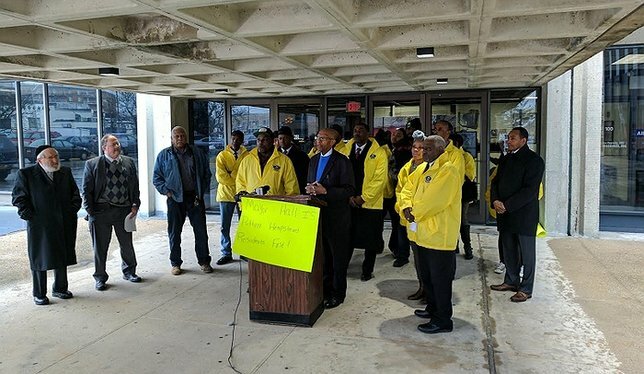 This development represents the kind of dedication to the Hempstead community for which Mayor Hall has fiercely advocated throughout his tenure, and which he demands from any developer seeking to build in the Village. Mayor Hall’s requirements for developers include prioritizing local residents and contractors so they have the opportunity to apply for jobs first. The success of this project sets a precedent in the Village of Hempstead, placing Hempstead first and signaling a new era of jobs and prosperity for residents seeking success. Subject: LongIsland.com - Your Name sent you Article details of "Hempstead Village Residents See Opportunities Soar"